I am here with another giveaway. I don't know why but the month passed too fast. I can't believe that this month giveaway is already here. Anyway, since this month I posted a tag and a CD sleeve I didn't have enough cards (I like to give six options, basically because this is the template I made a while ago and I don't feel like making it again, hehe). So I choose a card from August. Aquí estoy con otro sorteo. No me puedo creer que el mes se haya pasado volando y ya este con otro. Como el mes pasado he tenido una etiqueta y una funda de CD no tenía tarjetas suficientes para este sorteo (me gusta poner seis opciones porque es la plantilla que hice hace tiempo y no me apetece hacer otra nueva, jajaja). Así que he elegido una tarjeta de Agosto para rellenar. Lo más importante es que no os olvidéis de volver a la caja de Rafflecopter para que os den los puntos. Más abajo explico en inglés la traducción de las opciones que doy, así que no os preoupéis si no veis nada en castellano después de ese texto. Si tenéis dudas escribidme un mensaje. ¡Buena suerte!. As always the giveaway is in Spanish but these are the options in case you can't translate it (I am not sure if Rafflecopter do it for you). None of my options are mandatory, so just do the ones you feel confortable with. 1. 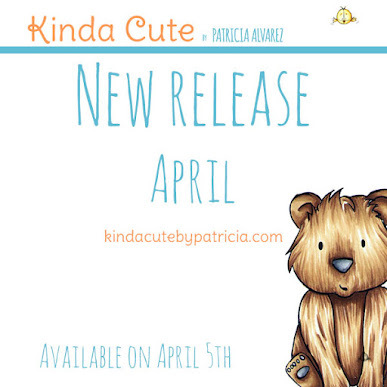 Visit Kinda Cute Cards in Facebook. 1 point. 2. Subscribe to my blog: Leave your email with which you are subscribed or the one you want me to subscribe you. 5 points. 3. 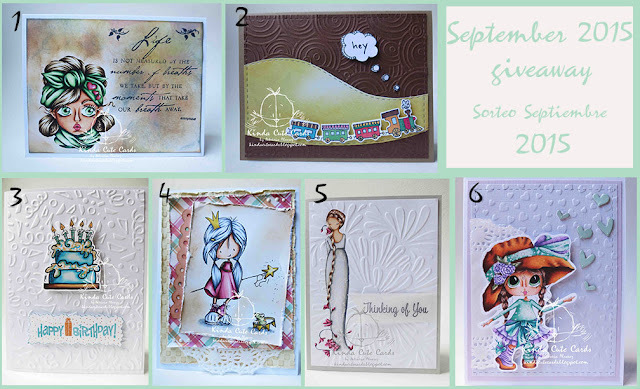 Leave a comment in my blog or my Facebook page with the card you would like to win. Paste your comment in the space. 1 point. Sometimes people have trouble commenting in my blog, that is why I offer the Facebook option. 4. Visit my YouTube channel and if you like it subscribe (you don't need to subscribe to gain your point). 1 point. 5. What is your favorite hobby? Do you have more than one? come back tomorrow and leave another comment to win another point. 1 point. And the most important thing: come back to rafflecopter and fill everything so your points are counted. If you have any questions let me know in a message or comment. Ya que la otra vez no me tocó, vuelvo a elegir la 2. Me encanta la 5, tiene un diseño muy delicado.